Thinking about adding a pool to your backyard? It’s a big decision for any family—but also an exciting one. As you begin your journey to becoming proud new pool owners, you’ll have several exciting things to consider. From the overall look of your pool to how you’ll use it, you’ll want to make sure you compare your options carefully. With the right planning, your dream pool will soon be a reality! The costs of an in-ground swimming pool can vary wildly, depending on several of the factors listed below, but also things like backyard grading and other construction costs. Our friendly staff at Crystal Pools will walk you through everything you need to know, but it’s always a good idea to set a budget for how much you plan to spend. With a budget, you’ll know upfront what you can afford, so you can prioritize the various items on your wish list accordingly. 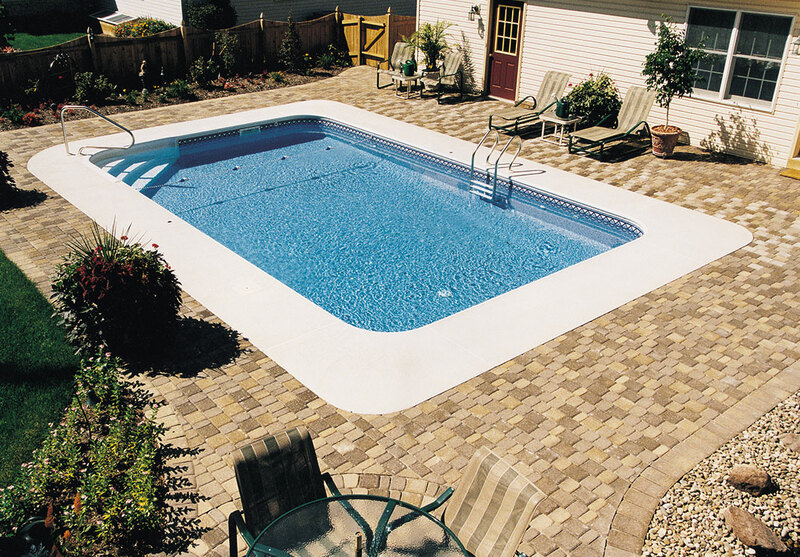 Vinyl liner, fiberglass, concrete – these are the three main types of in-ground swimming pools. Each one has its own unique advantages and also plays a large role in the cost of your pool. Liners, for example, are a popular option for their low upfront cost and virtually limitless options for size and shape. Fiberglass, by contrast, has a higher upfront cost but requires lower maintenance, and the installation is generally way faster (because the pool arrives in a pre-made shell). Educate yourself on all your options to determine the best fit for your backyard and budget. Are you dreaming of a large athletic pool that you can use for intensive swim training? Or something smaller and more elegant for the occasional summertime dip? There’s a lot to consider when choosing the size of your pool, including your budget, your backyard and your desired pool type. This is another key design feature that is affected by things like pool type and budget. But also, the shape of your in-ground pool should be primarily determined by how you’ll use it. For example, if you plan to be swimming laps, you’ll probably want a wide rectangular or oval pool. If the pool will be more for casual swimming, relaxation and backyard enhancement, then consider a shape with more curves and angles. Don’t forget all the fun stuff! There are so many ways to make your pool unique with things like diving boards, slides, fountains and so on. Be sure to check out all your options and use your budget to help prioritize the top items on your wish list. As you browse photos of swimming pools, you’ll notice that the most gorgeous ones are never surrounded by barren landscapes. They’re beautifully intermingled with shrubs, trees, water features and lighting. Landscaping the space around your pool is the key to making it a showstopper. But it can also balloon your budget. As you plan your swimming pool, be sure to account for the costs of using a professional landscaper. How soon do you want to be able to take a dip? Crystal Pools tends to book out 3-4 months in advance for the start of installation. Install time can take 3-6 weeks. There are numerous other factors that will influence installation time, so you’ll want to ask about that as you begin comparing your options. Let’s chat about your dream pool! At Crystal Pools, we look forward to discussing your pool plans, and we’re happy to answer any questions you have. Contact us today to get started on your dream pool.